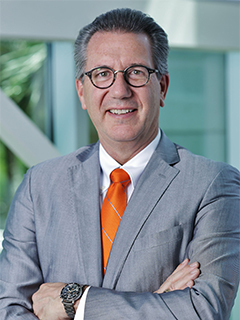 Executive Vice President for Academic Affairs and Provost Jeffrey L. Duerk is the University of Miami's chief academic officer, with appointing and oversight authority concerning the deans of the 11 schools and colleges, as well as the senior administrators involved with research, undergraduate and graduate education, and other academic areas. He has primary responsibility for budgetary matters regarding academic and research initiatives. Duerk, former dean of the School of Engineering at Case Western Reserve University, is an accomplished engineer and scientist, as well as a respected academic with deep appreciation for the social sciences, the arts, and the humanities. Throughout his distinguished career he has promoted many interdisciplinary research and educational initiatives. A leading expert in biomedical imaging, especially magnetic resonance imaging (MRI), he holds more than 40 patents and has been awarded numerous National Institutes of Health and industry-sponsored grants. He has published nearly 200 peer-reviewed scientific articles. In 2017 he was inducted as a fellow into the National Academy of Inventors, which recognizes academic achievement, innovation, and scientific discovery. Duerk joined the Case Western faculty in 1988 and was appointed dean in 2012. He was the founding director of the Case Center for Imaging Research, an innovative and interdisciplinary center that brings together engineers, physicists, physicians, biochemists, and radiochemists to explore and develop new biomedical imaging technologies and translational applications. He was also a founding leader of the Cancer Imaging Program at the Case Comprehensive Cancer Center. An advocate for study abroad and international collaboration, Duerk was instrumental in either planning, continuing, or putting in place research and student learning programs in Germany, Malaysia, Thailand, Philippines, China, Brazil, Romania, South Korea, Indonesia, and other locations. He is a fellow of the IEEE, ISMRM, and AIMBE, among other professional organizations. He received his B.S. degree in electrical engineering from Purdue University, his M.S. in electrical engineering from The Ohio State University, and his Ph.D. in biomedical engineering from Case Western Reserve University in 1987.